Damascus, SANA – Syria demanded deterrent measures by the United Nations against the terrorist organizations and the states backing and sponsoring them. The Syrian demand was expressed in two identical letters which the Foreign and Expatriates Ministry addressed to Chairman of the UN Security Council and UN Secretary General on Sunday. It was prompted by the bloody terrorist rocket attacks which hit Aleppo city yesterday, leaving heavy casualties of at least 19 civilians dead and scores of others wounded and causing massive material damage. The new crime, the letters said, came as a response from the regimes of Saudi Arabia, Qatar, Turkey and Jordan to the "important" outcomes that were reached at the latest Moscow inter-Syrian talks. In their "clear message" delivered by their agents of the so-called "moderate opposition", those regimes have sought to foil any political solution that could be reached by the Syrians themselves without foreign interference, the letters added. The Foreign Ministry dismissed the claim of those and other countries of them sending "non-lethal" weapons to the terrorists, stressing that a new type of destructive weapons seemed to have been used in Aleppo attack. Several four-story buildings were completely demolished, falling on their inhabitants’ heads, according to the letters. The Ministry blamed the continuation of terrorist acts on those countries which have not ceased providing direct support to the Takfiri terrorist organizations, including the notorious Islamic State in Iraq and Syria (ISIS) and Jabhat al-Nusra, in addition to the so-called "Free Army", "Islam Army", "Islamic Front", "Liwa al-Fateh", "Ahrar al-Sham Movement", "Al-Ansar Front", etc. Striking out at this continued support, the Ministry said the terrorist organizations would not have been capable of launching such bloody attacks, was it not for those countries shielding these organizations against punishment and continuing to supply them with weapons and explosives. It named France, Britain, Jordan and the US as accomplices in backing the terrorists. The Ministry demanded a Security Council non-politicized action towards enforcing counterterrorism resolutions in deeds not only in words. The Security Council, it said, is also called upon to cooperate and coordinate with the Syrian government, which "has been combating terrorism for years on behalf of the entire world people." The Syria government, the Ministry said, stresses dodged determination to continue fighting terrorism in Syria and defend its people by virtue of its constitutional responsibilities. 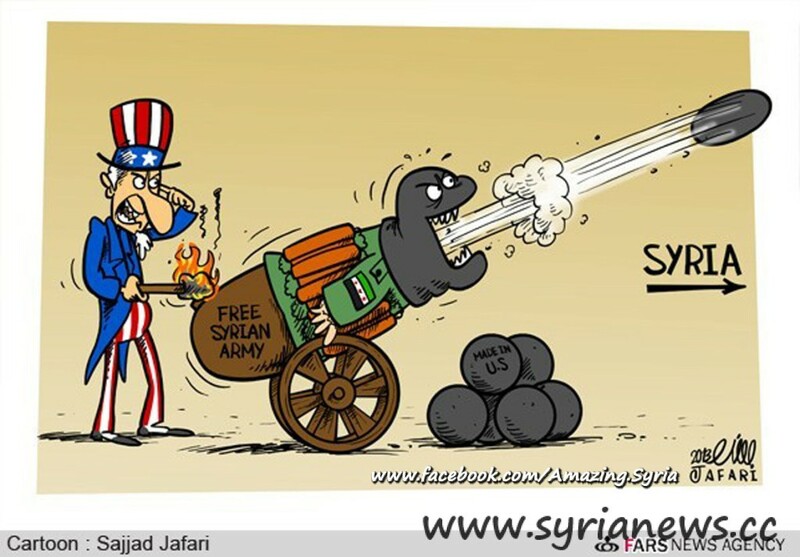 Land Destroyer | Syria: America's Democratic Terrorists? (10/4/15), VoltaireNet | Western wars have killed four million Muslims since 1990 (11/4/15), Global Research | Syria at the UN: US, Britain, France, Jordan Refuse to Name ISIL as “Separate Terror Group" (11/4/15), Global Research | Syria: "Al-Qaeda Linked Rebels" Are Al-Qaeda (13/4/15), Global Research | Israel moves to Cover-up its alliance with al-Qaeda in Syria (14/4/15), PressTV | Turkey, Saudis to form anti-Syria military alliance: Report (14/4/15). Popular conspiracy theories have it that al-Qaeda and the “Islamic State” (also known as DAESH, ISIS or ISIL) are Israeli- and/or US-intelligence creations. While there’s no evidence for that, it’s certainly true that the US-UK invasion of Iraq in 2003, and its consciously sectarian occupation regime of the country thereafter, created the conditions in which al-Qaeda in Iraq (later known as ISIS) was formed and thrived. Veteran journalist Patrick Cockburn demonstrates this most convincingly in his essential new book The Rise of Islamic State, which I have previously lauded here. From my recent viewing of some of the articles about the Syria conflict to which Asa seems to be referring, a conspiracy by the United States and its allies to set up ISIS as a bogus extremist 'anti-west' army to undermine popular domestic opposition to war seems to be a highly plausible explanation of the recent course of events. However, having read these words by Asa Winstanley, I will have to re-examine these articles more closely. Hizballah (my spelling is 'Hezbollah' - Ed) and Iran, allies of the Bashar al-Assad regime, are aiding the government in Syria and fighting on the ground alongside Syrian army troops against al-Qaeda, the “Islamic State” and other Sunni rebel groups. Could Asa be truly unaware that on 4 June 20914, Syrians overwhelmingly endorsed President Bashar al-Assad in presidential elections, as attested to by four International observers at a United Nations Press conference. See Global Research | Syria's press conference the United Nations doesn't want you to see (20/6/15) with embedded 52:45min video, republished on Candobetter. Mumbai, Public Meeting: "Analysing Yemen and crisis Middle East"
"Analysing Yemen and the growing Crisis of Wars across the Middle-East"
Date/Time: Saturday, 18th April 2015 from 4-6pm. Anil Tyagi, Farid Khan, Jyoti Badekar, Salim Alware, M A Khlalid, Sayeed Khan, Swapnil Tare, Farid Batawala, Imran Mubarak, Sohail Ajani, Zaheer Abbas, Aarti Badekar, Farouk Mapkar, Asim Khan, Abdul Qadri, Lilesh Lule, Arif Kapadia, Harshawardhan Vartak, Afaque Azad and Shadab Siddiqui. 1. ↑ Kishor Jagtap can be seen on this 8 minute video which was uploaded in Dec 2012 (currently there are two copies). Unfortunately there is no audio or textual English translation.